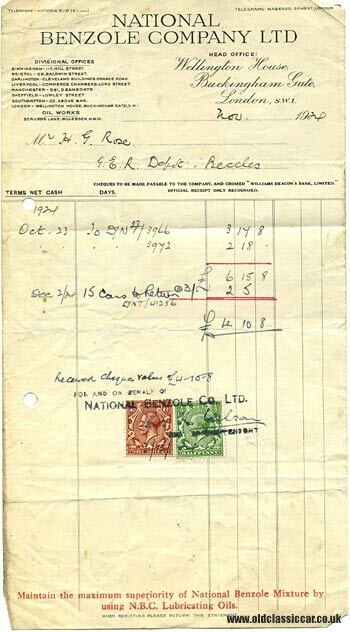 Vintage National Benzole motor spirit invoice and delivery note. Homepage. This page: Paperwork relating to deliveries of National Benzole Mixture to a Mr Rose, of Beccles. Several of these National Benzole Mixture invoices and delivery notes turned up a while ago, and one of each is now shown below. Both date to 1924, at a time when the distribution of petrol and benzole was in its infancy somewhat. 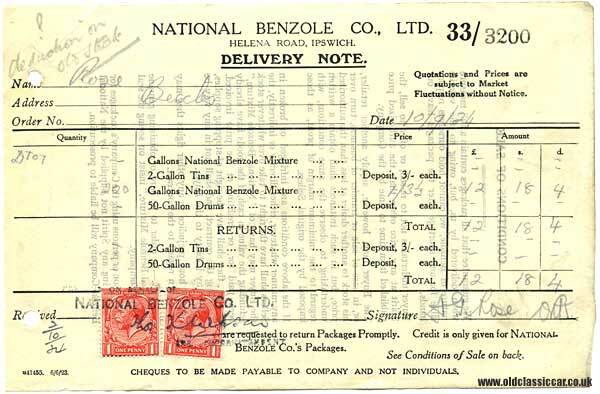 The delivery note, dated 10th September 1924, refers to 200 gallons of National Benzole Mixture - total price £12 18s 4d - being delivered to a Mr Rose, at a depot in Beccles, Suffolk. I've found a reference to a Mr H.G. Rose (those were his initials) as a supplier of coal in the 1920's in Beccles, and also as a corn merchant, so it's quite possible that he diversified into the supply of fuel when interest in the new-fangled motor-car really took off. The invoice, dating to November 1924, confirms Mr Rose's initials and also refers to his place of business - the G.E.R. Depot, in Beccles. National Benzole's head office was at Wellington House, Buckingham Gate, in London, with local offices dotted around the country in locations such as Birmingham, Bristol, Liverpool and Manchester. They also list an "Oil Works" at Scrubbs Lane in London. A refund has been given due to the return of 15 2-gallon petrol cans. A deposit of 3 shillings was paid for each purchase of fuel in a can, refundable on the can's return. More items of garage paperwork can be found in the Motoring Collectibles section of oldclassiccar.co.uk. In the vintage advertisements section, there is a wartime advertisement for National Benzole, fronted by Mr Mercury. More information on the subject of collecting petrol- and oil-related memorabilia, or petroliana, can be found on this page.